This is another recipe that I made up, based entirely around my love of leeks. Leeks are probably my favourite vegetable — I think it’s because I’m Welsh. I’ve got to like them, it’s patriotic. One day last week we had a spare leek in the cupboard and I needed something for lunch, so I decided to make this. And I am very glad I did. 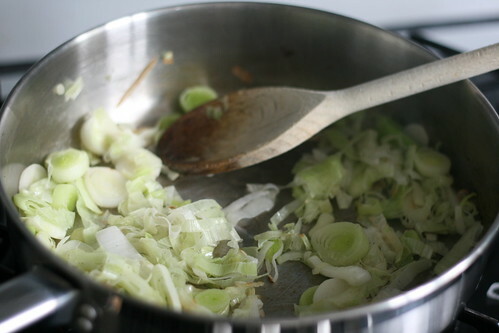 Slice up the leek thinly and fry it in a pan sprayed with Fry Light until soft. Whilst you’re doing this, turn on the grill and grill one side of the bread until it’s crispy. 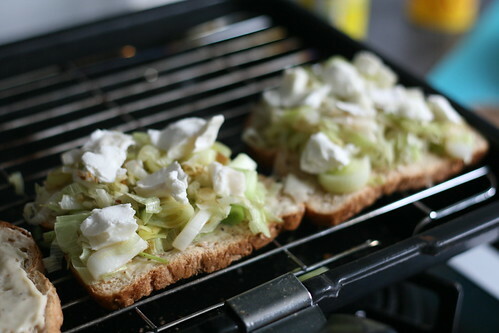 When the leeks are cooked, flip the bread over to the soft side and divide the leeks between them. Then crumble over the cheese. Grill the toasts until the cheese has melted, and devour. Takes five minutes but it’s incredibly tasty. The goats cheese works very well, but I’m sure you could try lots of things.